Item Package Quantity:1 Item Package Quantity:1 745930005 Features: -Angle provides space for nose and eye glasses while making drinking easier and more controlled. 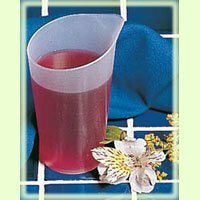 -Rigid plastic cup holds up to 6.5 oz. -Top rack dishwasher safe. -Unique angle reduces the need to tilt the head when drinking. -Made in the USA. Product Type: -Eating/Drinking aid. Country of Manufacture: -United States. -Appeals to children because of its ''leaning'' shape and handles on each side that provide a secure grip. Dimensions: Overall Height - Top to Bottom: -10". Overall Width - Side to Side: -8". Overall Depth - Front to Back: -3". Maddak specializes in home healthcare and rehabilitation products for the senior, disability and rehab markets. We have been recognized as the largest manufacturer in the United States of Aids for Daily Living (ADL). Maddak continues to design and manufacture products that increase mobility, maximize independence and enable people to live more rewarding, dignified and enriched lives. 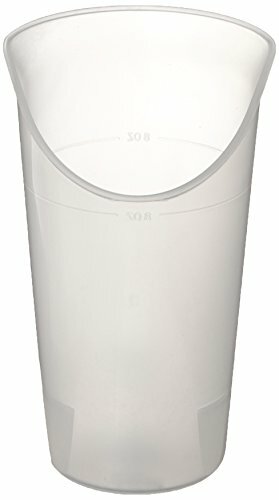 The Maddak Doidy Children's Nosey Cup uses aa unique angle to reduce the need to tilt head when drinking. 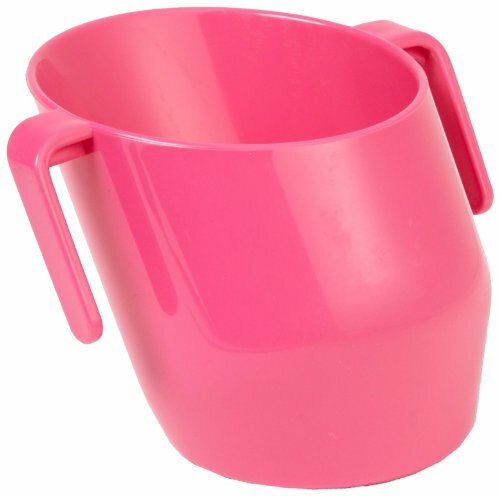 The Doidy-Children's Nose Cup appeals to children because of its leaning shape and handles on each side that provide a secure grip. The angle provides space for nose and eye glasses while making drinking easy and more controlled. The rigid plastic cup holds up to 6-1/2 fluid oz. (192 ml) and is top rack dishwasher safe for easy cleaning and reuse. Maddak specializes in home healthcare and rehabilitation products for the senior, disability and rehab markets. We have been recognized as the largest manufacturer in the United States of Aids for Daily Living (ADL). Maddak continues to design and manufacture products that increase mobility, maximize independence and enable people to live more rewarding, dignified and enriched lives. 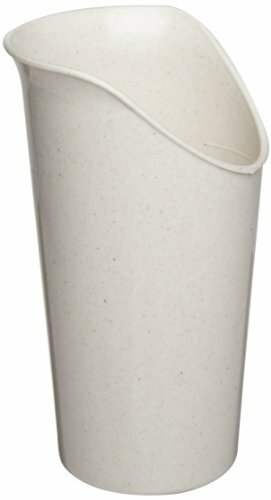 Maddak Sandstone Nosey Cup has a unique angle design that makes it possible to drink with little or no neck movement. The cup is ideal for people who have oral motor limitations, limited range of motion of the head, neck or upper extremities, or arthritis. The cup is designed to allow the user to drink with little or no shoulder flexion, wrist extension or head/neck movement, even if wearing a cervical collar. Special design provides space for eyeglasses. Dishwasher safe. Plastic. Holds 8 oz. (237 ml). Available in Sandstone, Light Blue, or Clear color. Packaged in Boxes of 6 cups of one color. Maddak specializes in home healthcare and rehabilitation products for the senior, disability and rehab markets. We have been recognized as the largest manufacturer in the United States of Aids for Daily Living (ADL). Maddak continues to design and manufacture products that increase mobility, maximize independence and enable people to live more rewarding, dignified and enriched lives. Item Package Quantity:1 The Maddak Light Blue Nosey Cup's unique angle design makes it possible to drink with little or no neck movement. 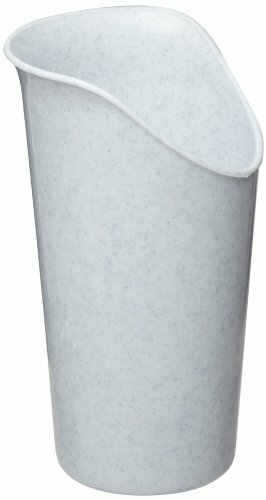 This cup is ideal for people who have oral motor limitations, limited range of motion of the head, neck or upper extremities, or arthritis. The cup is designed to allow the user to drink with little or no shoulder flexion, wrist extension or head/neck movement, even if wearing a cervical collar. Special design provides space for eyeglasses. Dishwasher safe. Plastic. Holds 8 oz. (237 ml). Packaged in Boxes of 6 cups of one color. Maddak specializes in home healthcare and rehabilitation products for the senior, disability and rehab markets. We have been recognized as the largest manufacturer in the United States of Aids for Daily Living (ADL). Maddak continues to design and manufacture products that increase mobility, maximize independence and enable people to live more rewarding, dignified and enriched lives. 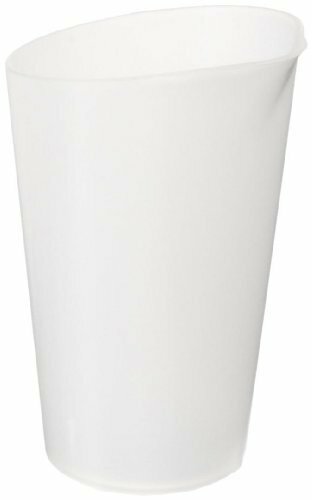 (SEE AVAILABILITY ABOVE FOR ESTIMATED DELIVERY) - Clear Nosey Cup - Clear Nosey Cup - This 8 - oz. cup has a cutout for the nose so a person can drink without tipping the head back or extending the neck. Transparent design makes it easy to monitor liquid intake at a glance. Unbreakable plastic. Dishwasher safe to 125°F. Latex free. - Rolyan products are internationally licensed & manufactured for home & clinical use. Most of their products offer a lifetime warranty. 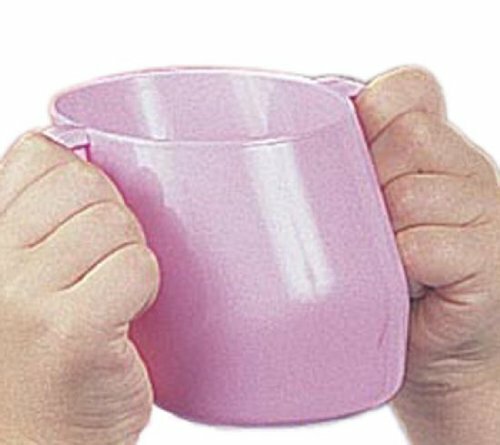 Maddak Nosey Cup is ideal for people who have oral motor limitations, limited range of motion of the head, neck or upper extremities or arthritis. The cup is designed to allow the user to drink with little or no shoulder flexion, wrist extension or head/neck movement, even if wearing a cervical collar. The special design prevents interference with the nose and eyeglasses. The Maddak Nosey Cup holds 8 oz. (237 ml). Dishwasher safe. Manufacturer Contact Information 18004434926 Manufacturer Contact Information 18004434926 Maddak specializes in home healthcare and rehabilitation products for the senior, disability and rehab markets. We have been recognized as the largest manufacturer in the United States of Aids for Daily Living (ADL). Maddak continues to design and manufacture products that increase mobility, maximize independence and enable people to live more rewarding, dignified and enriched lives. 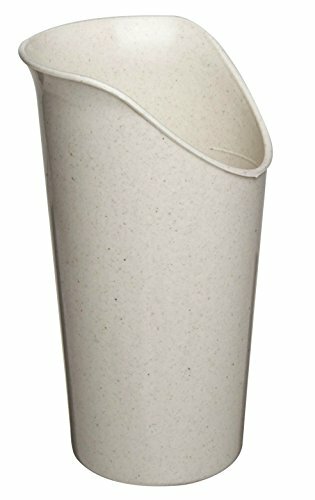 Ableware 745931000 Whiplash Nosey Drinking Cup by Maddak Inc. Shaped to direct flow to the center of mouth. ;For easy no-spill drinking. ;Cup is dishwasher and autoclave safe. ;Great if you have a stiff neck, use a cervical collar, have oral motor limitations or a limited range of motion of the head and neck. 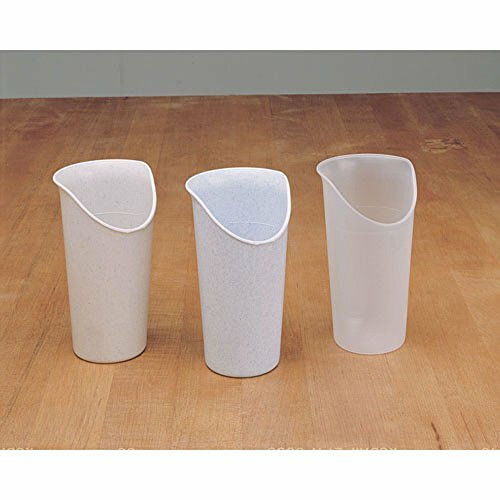 The unique angle design of the Maddak Nosey Cup makes it possible to drink with little or no neck movement and is ideal for people who have oral motor limitations, limited range of motion of the head, neck or upper extremities or arthritis. The cup is designed to allow the user to drink with little or no shoulder flexion, wrist extension or head/neck movement, even if wearing a cervical collar. Special design prevents interference with the nose and eyeglasses. Holds 8 oz. (237 ml). Dishwasher safe. Maddak specializes in home healthcare and rehabilitation products for the senior, disability and rehab markets. We have been recognized as the largest manufacturer in the United States of Aids for Daily Living (ADL). Maddak continues to design and manufacture products that increase mobility, maximize independence and enable people to live more rewarding, dignified and enriched lives. 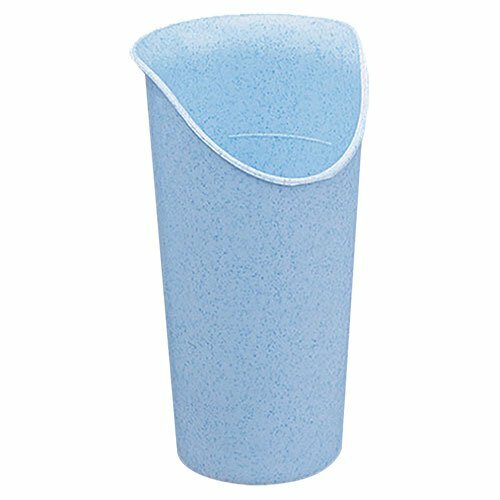 The Maddak Light Blue Nosey Cup is ideal for people who have oral motor limitations, limited range of motion of the head, neck or upper extremities, or arthritis. The cup is designed to allow the user to drink with little or no shoulder flexion, wrist extension or head/neck movement, even if wearing a cervical collar. Special design provides space for eyeglasses. The Maddak Light Blue Nosey Cup is dishwasher safe, plastic, and holds 8 oz. (237 ml). Maddak specializes in home healthcare and rehabilitation products for the senior, disability and rehab markets. We have been recognized as the largest manufacturer in the United States of Aids for Daily Living (ADL). Maddak continues to design and manufacture products that increase mobility, maximize independence and enable people to live more rewarding, dignified and enriched lives. Size: 12Nosey cup, 12 oz.